Just like many of you, we enjoy a good baked crusted Tilapia dinner sometimes. My recipe for Cheesy Baked Crusted Tilapia has only 7 ingredients with lots of flavor! It is always nice to find a ‘new’ recipe to jazz up baked fish! One of my favorite things to do in the kitchen is create recipes or adapt them to my families tastes. 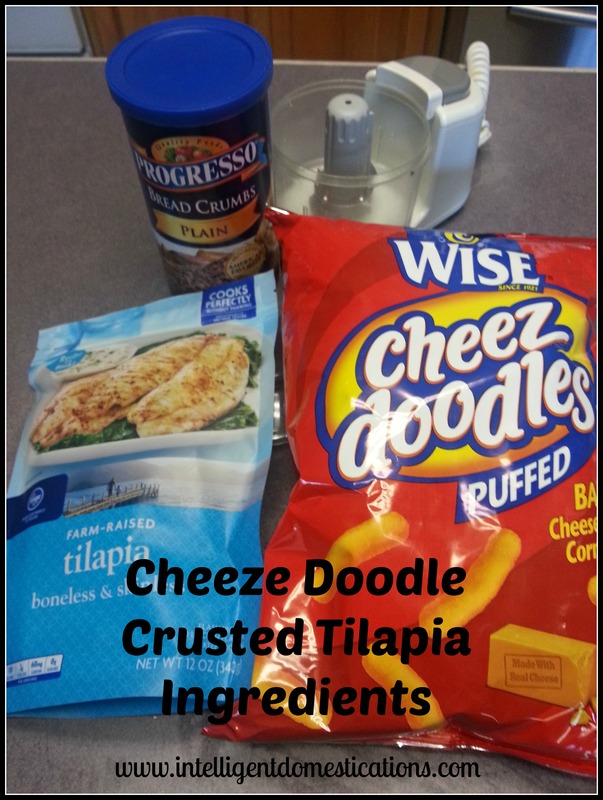 I came across a recipe for Cheese Doodle Crusted Tilapia and knew I had to adapt it for our tastes. They suggest frying the fish, we choose to bake it. Some of our preferred spices are also different. You can play with the recipe and personalize it for your family as well. I generally serve California vegetables or homemade mashed potatoes with our baked fish dinners. This time, my hubby wanted to try a frozen broccoli and pepper mixture. Do you own one of those little food choppers in the picture? (affiliate link) It is without a doubt the most handy tool in my kitchen. I have 2 of them because let’s face it, sometimes we get carried away in the kitchen. Beat the eggs in a bowl for dipping the fish. Place the flour in a pan for coating the fish. Mix together the crushed cheese doodles, bread crumbs and spices and place in a separate pan for coating. Dip each piece of fish into the egg, then the flour and then the cheese doodle mixture.Place on a baking pan and cook in preheated oven at 350 for about 10-15 minutes or until flaky. I’m a big fan of recipes with lots of flavor and few ingredients. Are you? I also like the idea of cook once, eat twice. Those are the kinds of recipes I like to share. This blog contains affiliate links. Please see our Disclosure policy. I need to make fish more often! Thanks so much for sharing with the Let’s Get Real Party. We hope you’ll link up with us again this week. Thanks for stopping by Gail. I would love to link up with you guys again! Thank you so much for sharing and posting! Our fish family will enjoy this. Cheese Puffs??? I never thought of using those crunchy things before. Must try it! I actually got the recipe from the Cheeze It’s website! Glad you liked it. That has become one of my husbands favorite dishes. Thanks for stopping by and thanks for hosting! Give it a try, Amanda. Let me know how it goes too. We love tilapia at our house – this looks good! And I have that same little chopper! LOVE IT!!! That little food chopper is one of my favorite kitchen gadgets! My immersion blender rates way up there, too. I cook a lot of fish and I will be adding your recipe to my collection. It looks wonderful! Thanks for sharing! Hi Shirley. I have had my little chopper for a number of years and I love it. It makes chopping things so easy! Can’t imagine being without it. It is such a handy tool in the kitchen. I have given them as Christmas gifts! I can’t remember what I was looking for when I came across that recipe but it has become a favorite of ours already.